Of course, the above list does not cover everything. Each application is unique, and you may have a special situation or questions specific to your career goals or background. Our MBA admissions team has put together our Top 5 Most Frequently Asked Questions below. Who has Texas residency status? 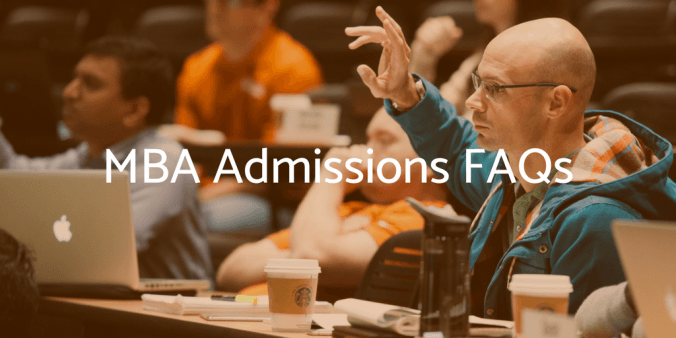 Everyone who applies to the Texas McCombs MBA is classified as a non-resident until they are admitted, accept the offer, and complete a Texas Residency questionnaire. So even though your status may look incorrect to start, if you’re a Texas resident, you’ll have a chance to prove it later on in the process. Order official transcripts from any university or college you attended EXCEPT junior or technical colleges. Have the transcripts sent to you directly. If your transcripts are in a foreign language, they must also be accompanied by an official English translation. Scan and upload all transcripts to your McCombs Application online. Scan and upload transcripts to the Graduate and International Admissions Center (GIAC). Store your official transcripts safely. If you’re offered admission and intend to enroll, you’ll then send your official transcripts to GIAC. We require one professional letter of recommendation from a person who has supervised your work and/or has assessed your performance during your career. We cannot accept additional letters of recommendation. Letters of recommendation are received directly from the recommender via a secure portal in your application. While completing your application, you will be able to send your recommender an invitation to access this secure portal to submit their recommendation. Once your letter of recommendation is received, you will be notified via automated email. Complete this part of your application first. This will launch email notifications to your recommenders and allow them to get started on the form while you’re working on the other components of your application. Contact your recommenders ASAP to let them know they should receive an email to avoid them ending up in someone’s junk/spam email folder since they come from a generic Texas MBA email address. Monitor the status of your recommendations in the McCombs application portal to ensure they’re completed within a reasonable amount of time, and by the deadline. You can resend notifications from within the portal as needed. How long do I have to submit my test scores? As long as you’ve taken a test and have made the request to have your official scores sent to UT Austin by the round deadline, your application will be considered “on time.” During the admissions process, we sync what you reported in the application with what’s received by UT Austin. It can take several weeks for your official score to be received by the university, and your application marks this item complete once it arrives. If you’ve decided to retake the exam after you’ve submitted your application, please notify the appropriate program as soon as you have your score. Please note there is no guarantee that your updated test score(s) will be considered in the evaluation of your candidacy, as this depends on when the McCombs Admissions Committee receives the update from you. Again, it’ll take several weeks for the official score to reach UT Austin, but be sure you’ve made the request to have the updated score sent. If you’re applying to multiple programs at McCombs, you don’t need to send separate scores to each program. UT Austin has a central repository for official scores that all departments can access. When do I pay the application fee? You will not be able to pay the application fee for about two business days after you hit the submit button, depending on when you submit your application. Your application is considered “on time” if submitted by the deadline, regardless if the fee is paid on that date. However, your application will not be evaluated if you do not pay the fee once it’s due. Within two business days of submission of your application you will receive an email with instructions for how to log into your GIAC MyStatus Page. Log into your GIAC MyStatus page to pay the $200 application fee. Your application fee status should reflect “Paid” in the McCombs application portal within five business days of submission. Upload Transcripts to GIAC after you have paid the fee. Note: Former University of Texas at Austin students will pay a transcript fee in lieu of uploading UT Austin transcripts to GIAC. We encourage you to review all the MBA application components in detail. And if you have additional questions, please reach out to us. These tips were originally posted on Sept. 18, 2017 and have been updated for this application cycle.